Please – don't be scared. I'm going to ask you to make cheese, but you don't need any special bacteria cultures or anything you can't pronounce. Please, just hear me out (and you might be in the cheese-making business by the end of this post). Are you still feeling skeptical? Two years ago, I would have been more sympathetic. 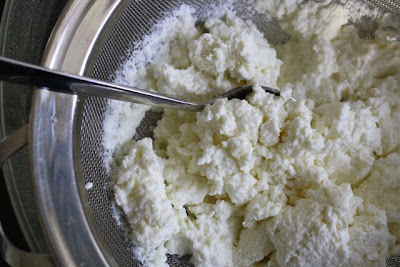 But my friend Madeline – who is a very good cook and a no-nonsense kind of girl – told me this ricotta was easy. I trusted her and she was right. Now I need you to trust me . . . and make your own cheese! That's a litre of milk, some whipping cream, a lemon, and a bit of salt. 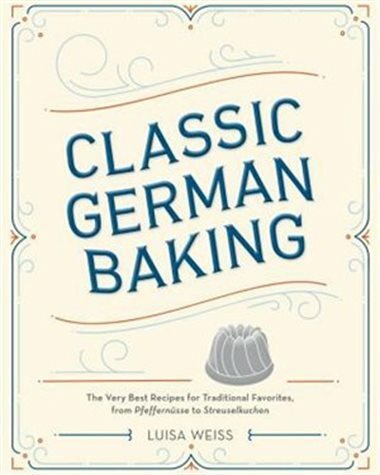 It's then as easy as bringing it to a simmer . . . Stirring in the lemon juice . . .
You may ask yourself: how many phone cords does this woman have? And sitting back and waiting a little while as the whey falls away and . . .
Voilà! You have your own homemade ricotta cheese! And your own homemade ricotta cheese is ever so much better than the (horrendously-overpriced) store-bought version. 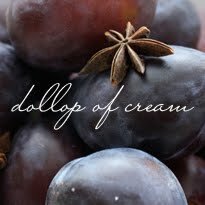 It's creamy and has this delicate taste that is lovely on pizza or in pancakes or on fruit with a drizzle of honey. Go ahead – just try it. P.S. This is my favourite pizza of the moment. It often shows up at our house on a Friday or Saturday night, along with a glass of red wine. Here's the low-down: tomato sauce, roasted pine nuts, thin slices of prosciutto, dollops of homemade ricotta, and mozzarella. If you have them, throw on a couple of basil leaves after the pizza comes out of the oven. 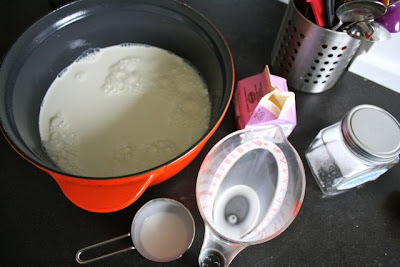 Pour the milk and whipping cream into a heavy-bottomed pot that's big enough to boil comfortably. Stir in the salt. Turn on the heat to medium and stir it occasionally with a spatula while you bring it to a simmer. 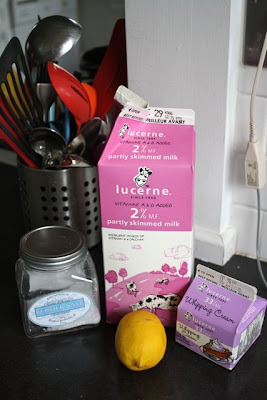 While you're waiting for the milk to simmer and keeping an eagle eye on said milk, measure all the lemon juice into a little bowl and set it aside. Also, get out your fine-mesh sieve and suspend it over a large bowl. 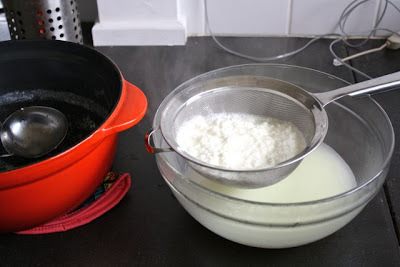 (If you don't have a fine-mesh sieve, line a colander with cheese cloth or a clean j-cloth.) Set aside. 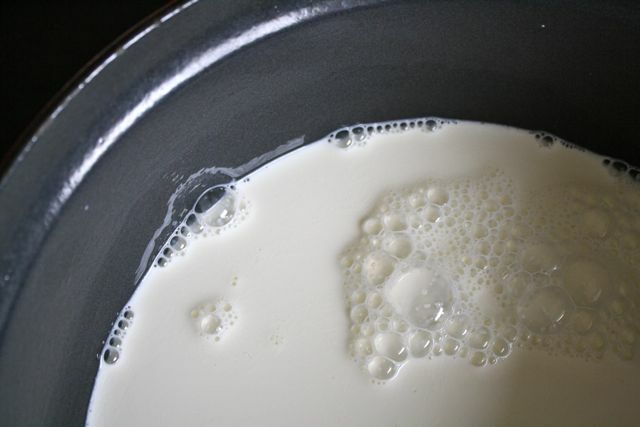 Is your milk simmering yet? If not, it will be soon and milk has a tendency to suddenly boil over, so watch it carefully. Once it's reached a steady simmer, add the lemon juice. Stir once with the spatula, just to blend it in. Set your timer for 1 minute and turn down the heat a bit so it doesn't boil too hard. After 1 minute, stir it one more time and leave it another minute. Once that second minute is up, you should see the liquid has separated into curds and whey. * Ladle it into the sieve you've set over a bowl. Let it drain at room temperature for 30 minutes to 1 hour, depending on your level of patience. Store in the fridge. 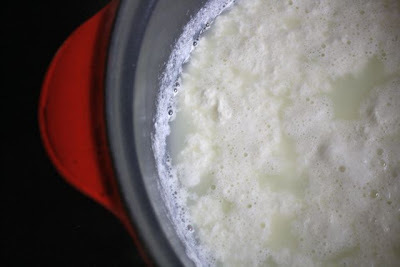 * Whey keeps for a couple days in the fridge and is great in pancakes and bread. Hooray for homemade cheese! I've made several batches of paneer, but haven't yet branched out into other fresh cheeses. 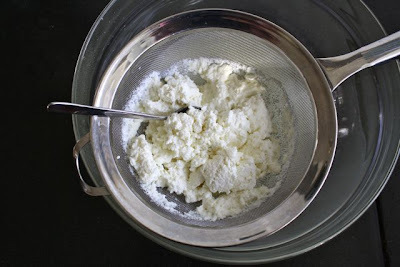 But this ricotta looks so good that I may have to give it a try! Yay! We made it last week for pizza night when we had friends over for dinner. New favourite combo is simple tomato sauce, dollops of ricotta and pitted olives....bake....then when it's out of the oven, shaved parmesan and if you have it...fresh arugula. I then ate ricotta spread on my toast every morning this week. That sounds like a great pizza combo. 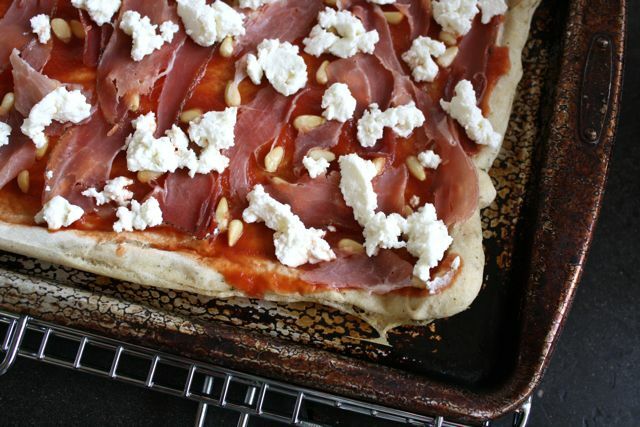 I love your idea of waiting till it's baked to add the parmesan and arugula -- we'll be trying it soon in Edmonton!